We all know the movie and TV version of New Orleans and its reputation for Mardi Gras and jazz, but what’s the southern USA city like for a vegan in search of food and fun? 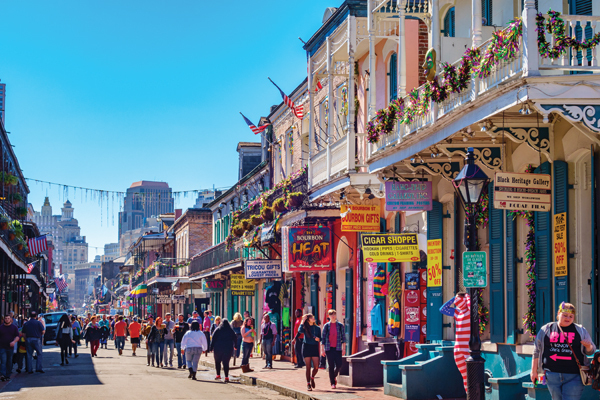 Sara Colohan is your guide to visiting The Big Easy. 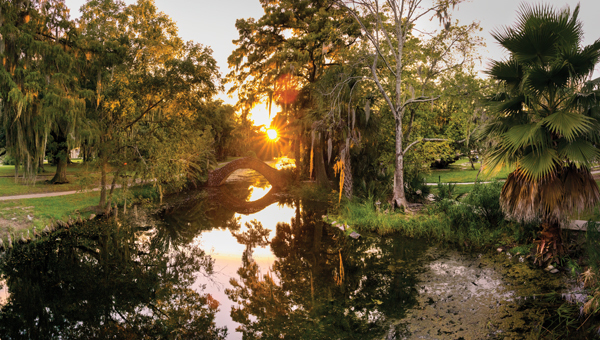 If New Orleans conjures up Mardi Gras and bourbon soaked nights for you, then you’re aware of some of the city’s more obvious charms and tourist attractions. Like most holiday destinations, there are alternative aspects to this city and I tried my best to scratch its southern surface and seek them out. 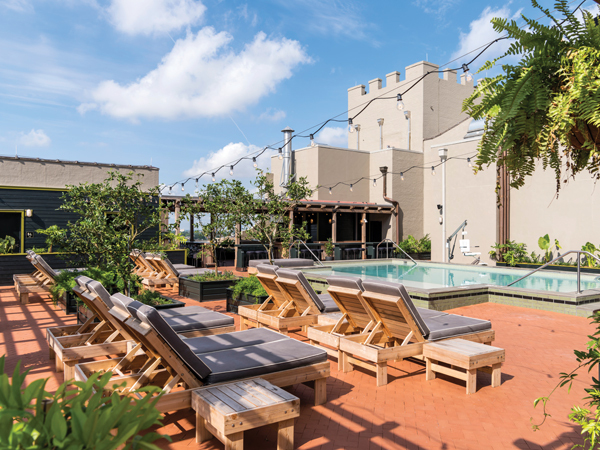 With its many vegetarian restaurants, thriving local art scene and various festive parades – maybe you’ll also consider a less obvious time of year to travel to NOLA. Easter time is a pretty big deal in NOLA so it’s worth considering as an alternative to the ridiculously busy Mardi Gras. The weather is a reliable 22 degrees (going up to 27 when I visited) and you can enjoy an occasional cool breeze, not something you get very often in this city. 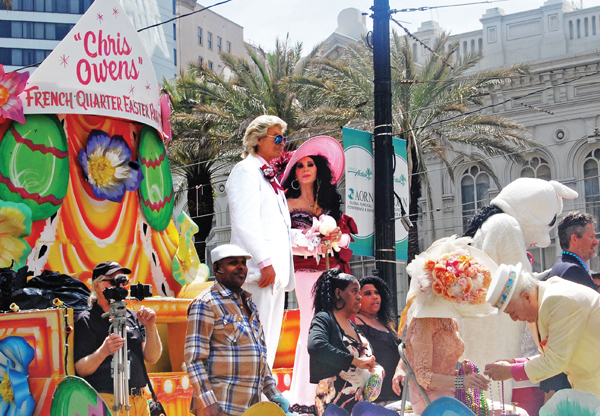 Along with a traditional Easter parade, there’s a relatively new gay pride parade, but possibly the most colourful and hilariously kitsch is the annual parade hosted by local celebrity Chris Owens. Ms. Owens is tipping 87 years old, but that isn’t stopping her dress in full southern belle regalia as she leads the parade of random floats. 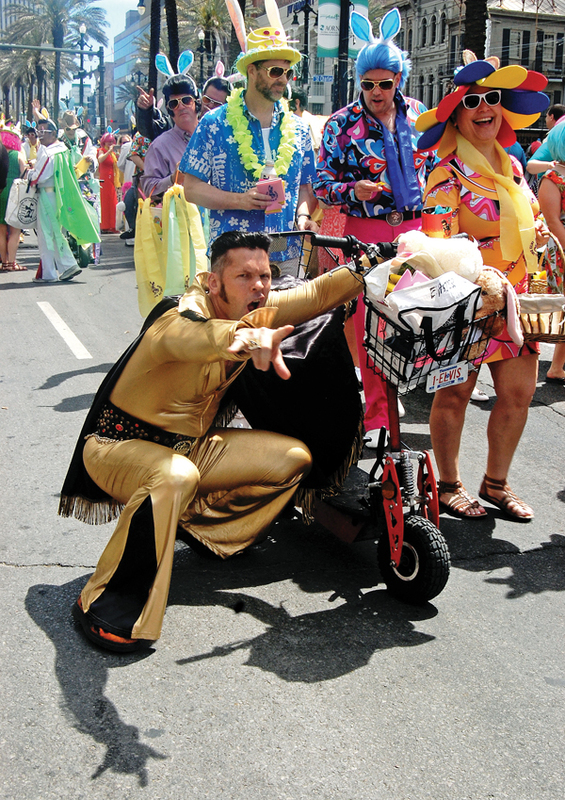 There is something for everyone, from chubby cheerleaders in ill-fitting costumes dancing to Beyoncé to a troupe of Elvis impersonators on mobility scooters called Krew of Rolling Elvi. If you time it well you can catch all three parades on Easter Sunday. Along with the parades and buskers galore, nearly everything else in the city channels its way through the main two streets Bourbon and Royal. From Canal St to the Mississippi banks there are cheap bars and tourist traps galore, but of course, like any good city, you can usually find some gems among the worn out tat. Speaking of tat, Bourbon Street seemed very tired and jaded. Worth seeing at night, but, mark my words, taking a walk there sober anytime during the day may make you question humanity and regret a good sense of smell. There’s no avoiding the odour or, occasionally, the drunken reveller who didn’t quite make it home. Hotels are plentiful all around the French Quarter (Think NOLA’s Temple Bar) and if being in the heart of things is your main aim, then you have to consider Crowne Plaza Hotel Astor. Easy access for walking and taxi collections, clean spacious rooms, daily serviced with small roof top pool and gym, all for around £86 a night. 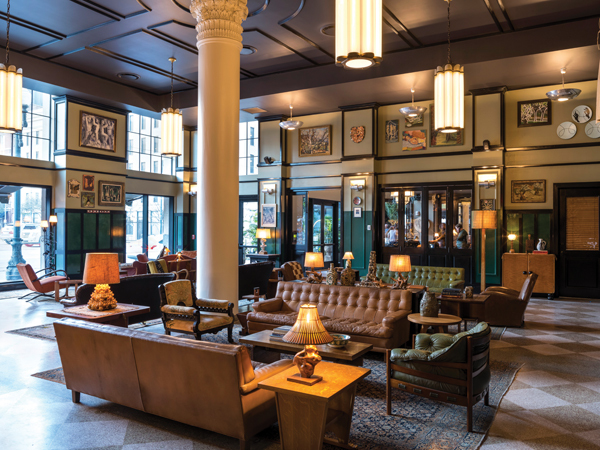 But if you want more from your hotel experience, an alternative to being a tourist on the main drag, then The Ace Hotel has to be a top pick. If you are familiar with the style of The Ace in Shoreditch or New York, The Ace NOLA has all the cool and comfort of these, but with its own twist. It feels vast, but homely, helped in no small way by the smell of warm popcorn from the self-service machine in the achingly cool front bar. The hotel is full of these little stylish quirky touches and, when you add in the top rate cocktails from either of the bars on the ground floor or the pool side bar and grill on the roof, a choice of in house restaurants (with a few vegan options) you are truly at risk of hanging round the hotel most of the trip. I felt a warm sense of inclusion when I stayed here, that feeling you get in a members club or your favourite bar. That’s what really sets this boutique chain apart from all the usual suspects. NOLA is a walking city (everything is grid style and the city is safe to walk at night) and The Ace is a welcome 10-minute stroll away from the madness of Bourbon Street. Veganism is on the rise worldwide, but it’s not the immediate culinary style you think of when you visit New Orleans. Crayfish, beef and gator steaks are still the norm, but it’s clear that New Orleanais are also embracing the move towards vegetarian and vegan style food. Vegan or not, we all have mornings when we crave fresh juices and healthy cleansing food and, if you seek them out, New Orleans can provide. Meals from the Heart is situated in the fabulously varied French Market and although it sells egg and crab dishes, it takes its vegan options seriously with a delicious vegan crab cake on offer! Green Goddess is off Royal Street and is veggie, but has a huge variety of vegan options. Definitely food you don’t see in London like ‘Grilled local Lemongrass tofu with Louisiana purple rice cake, served with pickled turnips and mirlton slaw, and sweet soy sauce’. Although not vegan or veggie, an honourable mention has to go to Shaya, situated on Magazine Street. Middle Eastern Israeli fare can often offer plenty to vegans and vegetarians and Shaya has some delicious vegan and veggie dishes. We were spoilt for choice with the multiple houmous dishes alone (opting for houmous with cauliflower, caramelized onion and cilantro and the asparagus, green garlic snap peas, sumac and cabernet vinaigrette option). Falafel and salads featured heavily, with very few meat dishes on their menu. 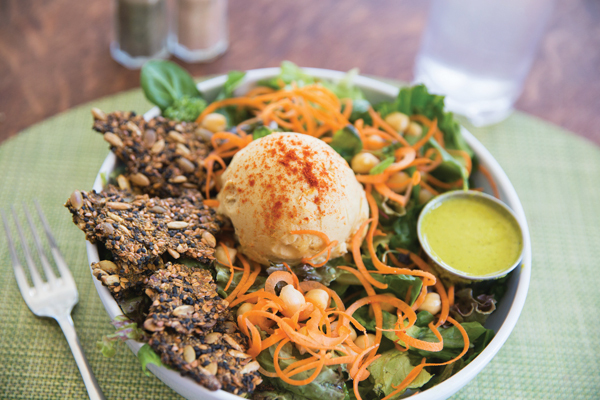 The fully vegan Max Well is in the Garden District and serves a great range of salads with an even better range of dressings and ‘power bowls’ full of vegan protein and healthy carbs. Seed (situated next door to little vegan boutique Cocoally) is a vegan restaurant serving ‘garden based, NOLA taste’ food and offers a pretty decent brunch and dinner menu. I had vegan nachos with roasted corn salsa, black beans and cashew sour cream and it was decent and filling. With vegan gumbo and creole zucchini wraps and a southern fried poboy (fried tofu, light chickpea flour breading, lettuce, tomato, vegan mayo, poboy bread) on the menu, you can get a taste of the southern specialities without compromise. 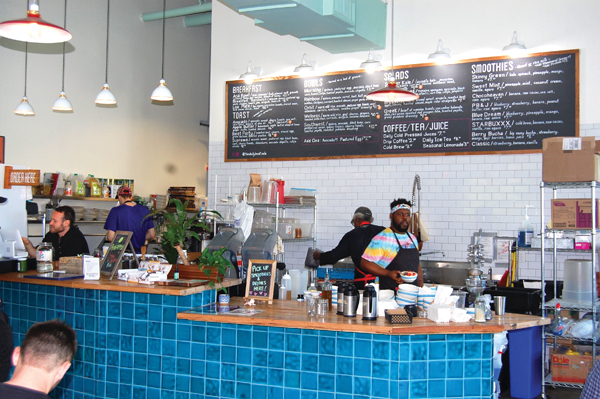 Good Karma Café is also fully vegan and, although I didn’t get to visit, the lovely ladies in the vegan café by Seed assured me it was one of the best in NOLA. The Daily Beet was my favourite on this trip, even though it was not fully vegan. Their acai bowls are brimming with crunchy granola, feather light coconut and frozen slush style acai mix. We actually went for the same breakfast three mornings out of five, as we felt we wouldn’t find better! Almond, coconut or soy milks are all available and it’s a five minute walk from your neighbour The Ace, in the sparse but stylish Central Business District. There are at least two Whole Foods supermarkets in the city too, so plenty of options. The city is thriving with art. Jackson Square has art pinned to its railings, as the more commercial side of NOLA art world sell their wares. 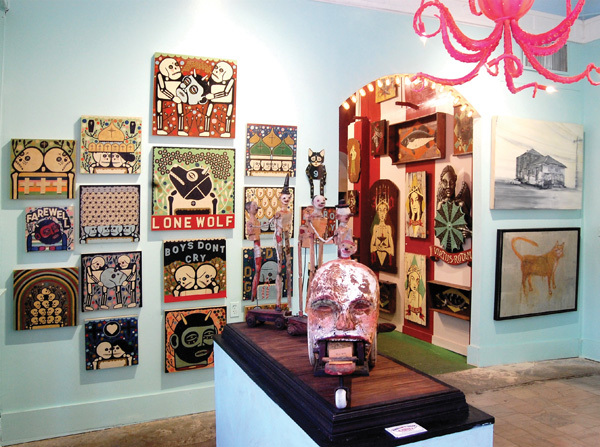 Royal Street has an array of surprisingly kitsch style galleries as you head away from Canal Street, with Red Truck Gallery a must-see for boundary pushing, alternative local and national art. Travel a little further away from the French Quarter, past the Business District you will find NOLA’s very own Arts District. The best $10 I spent was visiting The Contemporary Arts Centre on Camp Street. Its unassuming façade modestly veils its glorious natural wood beam supported interiors. Not the largest (only two exhibitions on for March-June), but I found it far more interesting than the Ogden Museum of Southern Art situated across the road, or indeed the WWII Museum next door. New Orleans is not cheap, nor is it exactly a fashion capital and other than a splatter of pricey, quirky art galleries and a few voodoo and witchcraft shops (check out Hex, Witchcraft shop on Decatur Street), you are more likely to be spending your money on good bourbon and dodgy swamp tours. But don’t fret, there is a Sephora (for all of us starved of this great institution back home), and for the vintage look fans there are a couple of stylish outlets worthy of a mention. Trashy Diva hosts two stores on Royal St specialising in deluxe lingerie and stylish reproduction vintage fashion. You could also visit the Museum of Death on Dauphine Street (adults only) to pick up arguably some of the best-designed merchandise from the city. This ‘museum’ is a tiny space packed with artwork and letters from serial killers, mummified shrunken heads and everything in between that is morbid and grotesque. It’s definitely an alternative way to kill an hour or so (killer pun intended). All in all, I found New Orleans worthy of a visit, but felt my five nights may not have been enough to experience the deeper layers it might have to offer. I left without experiencing anything truly authentic and wondered how this city could even develop an alternative side with so many tourists to pander to. Sara Colohan is a writer and vegan chocolate maker based in London. Thanks to her keen interest in all things vegan, she’s now writing for Vegan Food & Living, asking questions and discovering new and exciting options and products for anyone vegan or just interested in vegan lifestyle. Sara owns an emerging vegan chocolate brand called London Maker.